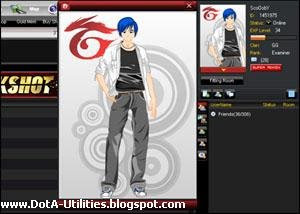 Get yourself familiar with the new Garena Avatar system now and start playing in Style! 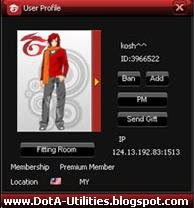 •All registered accounts will have a default avatar set depending on their account gender. 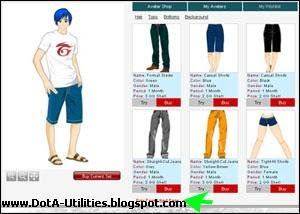 •After clicking on the "Fitting Room" button, you will be redirected to the avatar webshop. 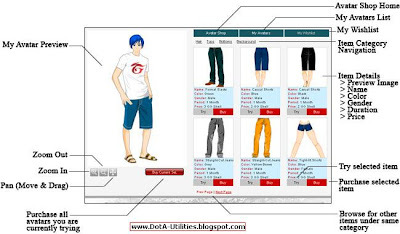 •Get yourself acquainted with user interface of the avatar webshop. See image below. •The left side contains your avatar preview and the zoom & pan feature for you to adjust the display according to your preference. Located at the right is the avatar items menu. 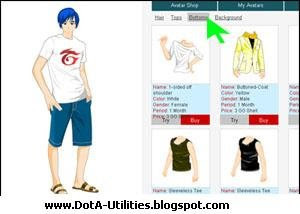 •Log in to Garena webshop. You can only purchase avatars and do other functions when you are logged in. •After logging in, all your avatars used and in the closet will be loaded. 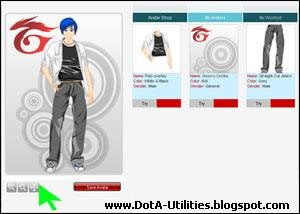 •Once you have find the item you like, click on the "Try" button to see if the avatar fits well on you. NOTE: You can only try on avatars that is applicable to your gender. 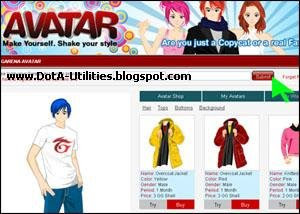 Click on "Buy" to purchase avatar and be able to use it live. 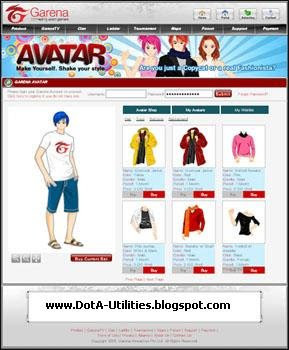 •After buying the avatar, you will be redirected to the "My Avatars" menu. All purchased items can be seen here. 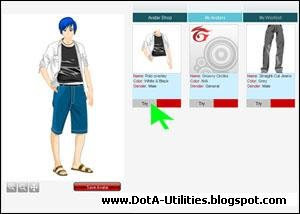 Look for the item you wish to dress up then click on the "Try" button. 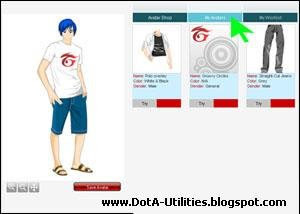 The selected item will be reflected to you avatar preview on the left. 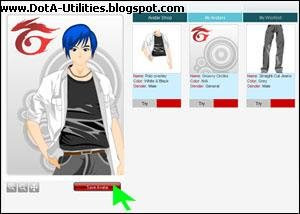 •The avatar system allows user to adjust the user's avatar display focus by allowing user to zoom in or zoom out and pan the position of your character. 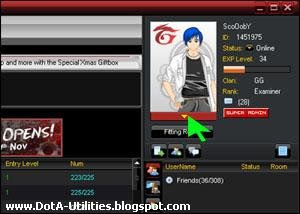 •The zoom and pan option is located at the bottom left corner of the avatar preview panel. 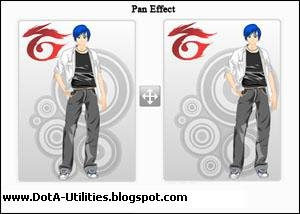 •The Pan effect allows you to move the character from center to left and right or top and bottom. 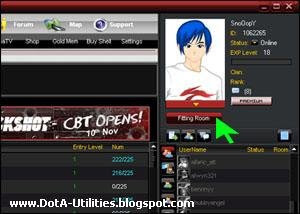 To move from side to side, click on the pan button then click and draft the character. 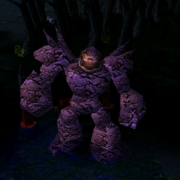 The Zoom In / Zoom Out allows you to adjust the focus to your preference, click on the + to zoom in, click on - to zoom out. 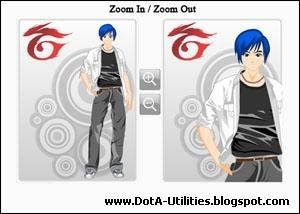 •After selecting your best pose, the last step is to save the avatar! Only after clicking on the "Save Avatar" button, located just below avatar preview, will your avatar be updated with the newly used items.